In the Middle Ages travelling to the Mediterranean was as favourite a destination as it is nowadays. People didn’t go there for the lovely weather but to visit and ‘rescue’ the places Jesus Christ, their Saviour had lived. Jerusalem was so central a place in Christian history and theology that the desire to visit its holy sites, especially those of Christ’s death and resurrection pervaded medieval culture. Clerics, pilgrims, crusaders, diplomats and traders from Western Europe did go to Jerusalem and the Holy Land and they all went by land. Travelling the Atlantic was much too dangerous so they had to cross the Alps and the Mediterranean Sea. In the twenty-first century we wonder how Jerusalem was linked to our medieval world. We have from the thirteenth-century a kind of medieval road map linking London through the major cities and towns of medieval Europe with the great centres of pilgrimage: Rome and Jerusalem. The maps have images of towns, their names and descriptions of places. When linked together they make a wonderful itinerary and an easy travel trough Europe and the Mediterranean to the holiest of places: Jerusalem. These itinerary maps were bound in manuscripts made by Matthew Paris, a monk of the Benedictine abbey of Saint Albans in England. He kept the chronicles and annals for his abbey but thankfully he did a lot more and wrote a historical work the Chronica Majora. This historiography describes the history of the (known) world from Creation to 1259 and is an important historical source document especially for the period between 1235 and 1259. Those were very famous days as it were the times of the Holy Emperor Frederick II (1220-1250), the Seventh Crusade (1248-1254) or the Mongol invasions in Europe (1230-1245).This Chronica was made in three different manuscripts and each manuscript began with a few maps. 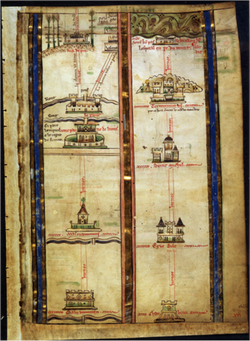 Seven of those maps together form the thirteenth-century roadmap from London to Jerusalem. So we have three times seven itinerary maps leading to the Mediterranean world. My project was to research the meaning of the maps. It is a bit curious why a very busy monk who wrote eighteen manuscripts by hand and also draw the illustrations made time to make an itinerary map to Jerusalem where he never could go himself. · Social network; what were the sources Matthew could have used to make his maps. · Historical network; what do we know about the reliability and ethics of medieval chroniclers. It turned out Matthew had a lot of sources for reliable information and chroniclers took their work very seriously. The connection between London and Jerusalem is made through a century old network of roads. From the Roman times these roads came into being between towns a day journey apart along the European rivers. London was the starting point and it went across the English Channel, along the rivers Seine and Saône across the Alps and along the old Roman ways into Italy. From there it was possible to cross the Mediterranean Sea and arrive in the Holy Land. Most interesting question is with what purpose a Monk who would never go there himself made such a detailed and informative map and connected London to Jerusalem? Scholarly discussed are three possibilities at the moment. · The maps are made as illustrations to accompany and clarify the written historical text of the chronicle they’re bound in. Matthew scribed and illuminated his work and wrote a lot about the crusades of his time. It is also known that in these centuries because of texts becoming longer and books growing bigger they were searching for marks and ways to remember, classify and learn by heart information. It could be the maps illustrated a story or was made to classify information in the chronicle. It is great fun to follow the roads that lead along towns nowadays known for their medieval abbey, church, wall or castle and realize it are still the roads we can use today. In the thirteenth century also a lot of people travelled trough Europe, some of them with different reasons then today but they did and much more than most realize. Even monks living a live of contemplation knew how to go to Jerusalem. Matthew made them a 'Tom-Tom', one we still can enjoy today. · Breen, Katharine. 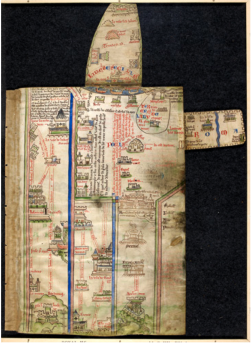 ‘Returning from Jerusalem: Matthew Paris’s first map of Britain in its manuscript context’. · Clanchy, M.T. From memory to written record. England 1066-1307. Chichester: Wiley-Blackwell, 3de druk 2013. · Lewis, Suzanne. The art of Matthew Paris in the Chronica Majora. Berkeley: University of California Press, 1987.